The ‘pearl of the Indian Ocean’ is an island of striking natural beauty with a documented history of over 3,000 years; from the time of the ancient Silk Road to World War II. 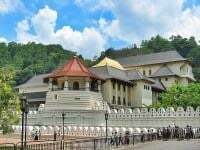 Sri Lanka is specially known for its Buddhist heritage, and it was on the island that the first known writings of Buddha were composed. But the archaeology of human occupation on the island goes back many, many thousands of years to early Homo sapiens. 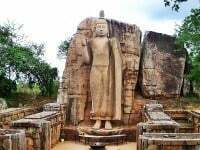 At twelve metres high with a delicately carved closely worn robe, this statue of Buddha is generally accepted to be one of Sri Lanka’s finest. 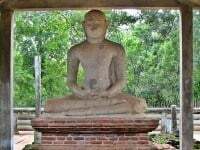 The statue is not far from the village of Avukana, from which it takes its name. It was carved out of a large granite outcrop in the fifth century. It is not entirely free standing, there is a strip of rock at the back that joins the statue to the original parent rock. The statue stands on a lotus-shaped pedestal, and was once part of a shrine built of brick and stone – remains of which can still be seen today. 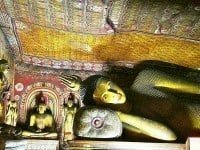 Sigiriya was a 5th century capital city, that still has remains of many extraordinary features. These include the city’s defensive moats and fortifications, expansive and elaborately landscaped gardens, and a monastery. A two-hundred metre high rock that stands out from these ruins is, however, undoubtedly the star attraction. The flat-topped, granite outcrop has the remains of a royal palace, while one of the rock shelters has exquisite frescoes of female figures, often referred to as ‘the Maidens of the Clouds’ … read more.